Olive Pink Collection. 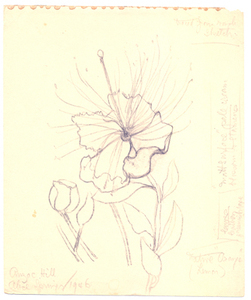 Pencil on card sketched by Olive Pink, Anzac Hill, Alice Springs, 1946. "Traced from rough sketch - matt surface pale cream blossom and stamens, leaves leathery greenish - mature "orange" (lemon)"
Pink, Olive 1946 , Olive Pink Collection. Pencil on card sketched by Olive Pink, Anzac Hill, Alice Springs, 1946. "Traced from rough sketch - matt surface pale cream blossom and stamens, leaves leathery greenish - mature "orange" (lemon)" , University of Tasmania Library, Special & Rare Materials Collections, Hobart.